The Friends of the Carlton, whittling the number of meetings down to as few as possible, have still had a busy 2016-17 season. Here are some of the accomplishments, consistent with our mission as a community support group for public natural land. As chapter of Friends of Sarasota County Parks, our 501(c)3 parent, we were able to double the amounts that our member/donors contributed during the Giving Challenge in October! Wildlife Monitoring 2. We expanded the wildlife monitoring program with 10 cameras at permanent locations as well as temporary deployment. In December a staff member sighted a panther and we deployed cameras to strategic locations—to no avail, alas. The bear from Nov. 2015 did not reappear. Swallow Tailed Kites 3. In partnership with local Audubon groups, we helped fund research that tracks the nesting/migration routes of these incredible masters of flight. Three nests were located in the Reserve and “Carlton” (our bird with collar) was tracked as far as central America. Fire Fest 4. We helped prepare the public area, parked cars, greeted and provided directions, distributed free T-shirts to children and helped pay for food and drinks for visitors at this event which has grown dramatically each year (over 600!). Information Kiosk and Cabin 5. We provided funding and labor to construct the recycled plastic display case which is a work in progress. Three more cases will be constructed by next season, doubling the display area for laminated posters. A “photogenic” trail map is planned that will allow park visitors to snap a picture with their cellphones before setting out. A refrigerator, previously purchased by the Friends and refilled with water, has provided free refreshment to hikers, bikers, volunteers throughout the year. A monthly list of public walks and events is posted on the cabin as well as maps and information provided by member/volunteers manning the cabin. Reserve security and safety 7. Volunteers have helped staff and law enforcement by locating and monitoring areas of illegal activity (fires, dumping, vandalism, poaching), removing hunt stands, repairing damaged property, removing dumped materials, reporting broken water lines, inoperable lights, damaged locks, bathroom equipment malfunctions, monitoring/removing old benches and picnic tables, replacing signage, assisting lost hikers/runners. Education and Information 9. Friends maintain a website and FaceBook page with downloadable trail maps, photo galleries, news items, events calendar, links to related resources, with nearly 10,000 “hits” per year. Volunteers assisted in the production of educational films that aired on the Eduction Channel and featured activities in the Carlton. 1. The wildlife monitoring program now has ten cameras, a collection of 500 saved pictures and over 8000 records. $800 was spent to replace outmoded or non-function cameras. 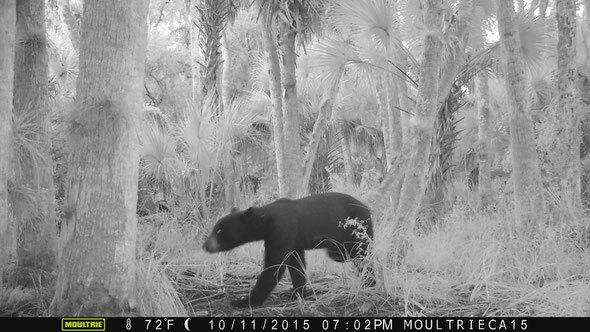 One of our cameras captured and documented the first recorded bear in Sarasota County history. This program requires several volunteers, many hours-- scouting, placing, securing, retrieving cameras and memory cards, entering data, computer time archiving pictures, manipulating data for reports to staff and news media when requested. 2. The Friends purchased and installed a new 6 panel informational kiosk in front of the cabin and filled it with laminated posters (purchased describing Carlton flora and fauna. 3. The Friends assisted at the County sponsored FireFest by directing traffic, distributing T-shirts. manning an informational booth with maps and information. Click here to see the photo gallery by Jean-Louis Dumaine. 4. In April 2016 the Friends spent $540 on materials to build a Giant Air Plant sequestration cage. Jeff King donated materials and labor for a second cage. One cage is located in the public area, the other near the tractor barn (marker13). Both cages now protect mature plants (some likely 15+ years old) from weevils. They are providing a seed bank to help ensure the endangered GAP's survival in the Carlton Reserve and on other public lands in Sarasota County now being decimated by an invasive Mexican weevil. Friends assisted Darryl Saffer in the production of 3 episodes of the Florida Field Journal on "The Evil Weevil." Click here to view full list of 44 episodes. 5. 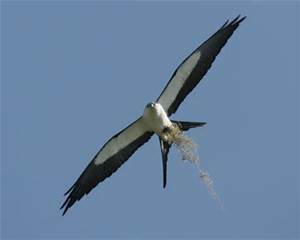 The Friends donated $750 to the Swallow-tailed Kite project--another species declared endangered in other states. At least 3 pairs successfully nested in the Carlton Reserve this spring. The nests were documented and monitored. One bird was netted by professional researchers who will track its migration southerly, probably through Central America to Brazil's rainforests and hopefully back to the Carlton Reserve next year. 6. This website received more than 10,000 hits and provides the public with maps, photo galleries and contact information regarding camping, trails, history, and events. 1. Regular Wed. workdays from Nov-May when the volunteer crew helped maintain trails, painted and replaced markers, repaired vandalism, swept picnic area and tables, trimmed and hauled debris away from public area, mowed narrow trails in designated public use area, smoothed hog damage with tractor, cleared debris and trimmed at Windy Sawgrass Camp, removed fallen trees from trails with chainsaw and tractor. 2. Located 2 illegal hunt stands and worked with law enforcement to surveil and dismantle them. 4. Manned visitor cabin on Saturday mornings, posted monthly County calendar of events, refilled map kiosks, distributed free water and answered questions. 5. Led guided walks for Venice Newcomers, Meetup groups. 6. Met to be interviewed by local news media regarding bear sighting. 7. Guided/transported videographer who was filming episodes of the Florida Field Journal for the Education Channel (for use in Sarasota County Schools). 8. Assisted river biologist/ranger in monitoring Myakka River for illegal activities (campfires, cutting of trees, littering, reckless use of watercraft). 9. Assisted staff in monitoring the location and condition of new bicycle trails, trail clearing activities and signage. 10. GPSed locations of invasive plant species and notified staff. 12. Secured building after theft of tools, met with law enforcement, and helped inventory missing items. 13. Reported restroom and water conditioning malfunctions (2 incidents). 15. 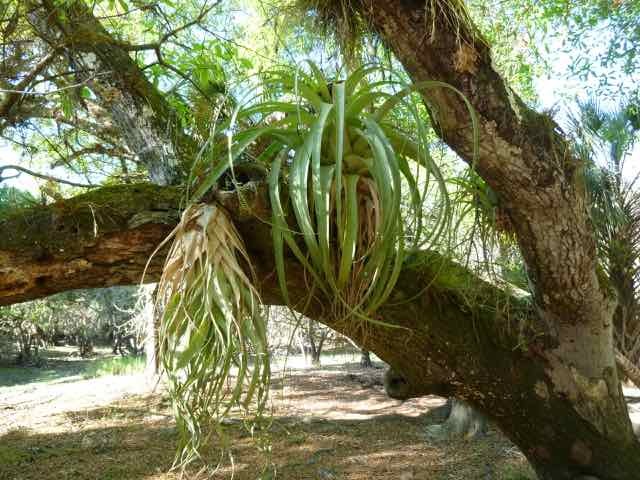 Hosted consortium of experts and volunteers to discuss Giant Air Plant/ Mexican weevil problem. 16. Read traffic counter and recorded tally in database. 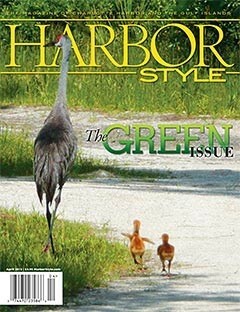 This is the cover photo of the "green issue" of Harbor Happenings which features the T. Mabry Carlton, Jr. Memorial Reserve (beginning page 78). The sandhill crane mother and chicks are on the trail immediately in front of the cabin. 14. Provided interviews for staff writer, transportation for photographer for a special issue of Harbor Happenings that featured an 8 page article on the CMR. 22. Moved logs to parking area and exit road to deter “mudding"
23 Trained and assisted staff in the use of “our” haywagon at the opening of the Walton Preserve. 24. Invited by and honored by Lisa Carlton at an Argus dinner recognizing T. Mabry Carlton, Jr. Assisted bike group with routing a 10 mile loop trail and donated posts for signage. Removed derelict trailer and cleaned up debris from Tucker's Camp. Washed main entrance signs and cleaned mildew from informational signs on trails. Weeded and maintained landscaping at front entrance. Provided monthly guided bike rides for families and weekly Tuesday night rides. Provided guided walks for Newcomer, Meet-up and resident groups. Resupplied hay wagon with hay. 1. 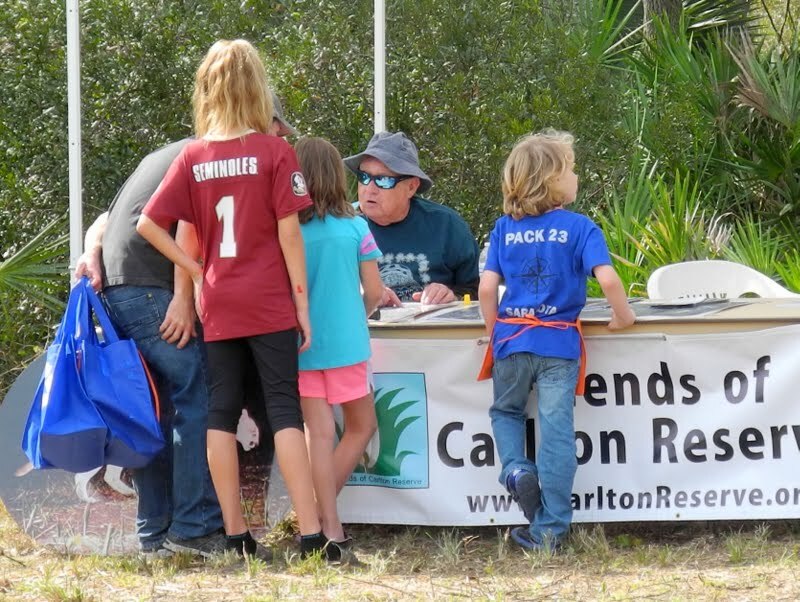 The Friends of the Carlton shared in the cost ($350) of building a new kiosk that guides visitors on a new hiking/biking trail constructed by a newly formed group of bicyclists, SCORR--Sarasota County Off Road Riders. Their counter on this popular trail is tallying a record number of visitors to the Carlton Reserve. 2. The Friends of the Carlton received word that they will be receiving a $200+ grant from Microsoft. Microsoft recognizes with matching grants, employee time that is donated to "not for profits" and public entities. Friends of the Carlton worked with Drew Shell and Julie Scherer who regularly visit the Carlton Reserve and other public lands to inventory plant species as well as locate invasive species. Last year's efforts were rewarded with the first Microsoft grant amounting to over $500. 4. The Friends of the Carlton are purchasing straw for the hay wagon so that Sarasota County trained volunteers can resume hay rides this season. The frame was previously donated by The Friends of the Carlton to SC parks and Recreation which actually built the wagon's floor and sides. 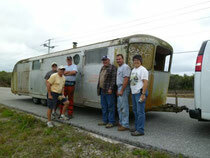 A custom bimini top was later added, thanks to a donation by Fred Starling. 6. The Friends of the Carlton have been offered space at the Kiwanis Venice Expo to be held on Feb. 28 and March 1 at the Venice Community Center. They will be sharing the space with Friends of Legacy Trail and providing maps and information about the Reserve in person and in videos. 7. Friends of the Carlton Reserve led a group of 34 members of the Garden Club of Pelican Pointe on a 2 hour guided tour of the Reserve, Jan. 22, 2014 which included a guided hike around the blue trail and a presentation in the cabin that included maps, history, information about natural habitats, flora, fauna, trails and activities. The Friends of the Carlton are alive and well! If you've visited the Carlton Reserve in recent weeks--to hike, bike, paddle, ride, observe the wild things or meditate in quiet solitude--you've probably already noticed the changes that fall brings. The often flooded landscape of summer has given way to wildflowers: blazing stars (liatris) and Catesby's lilies, especially along the red trail. Kenya Leonard has organized a team of regular Wednesday volunteers. If you are interested in helping out, send Kenya (KLeonard@scgov.net) an e-mail to get registered and placed on the e-mail list. You may notice in the cabin some new artifacts related to turpentining that were collected and donated by Rand Carter, including some tools and a barrel of processed resin. We expect to offer a variety of public programs as the season progresses, based on the survey which many of you responded to. Toward that end, we have added 20 stack chairs to the cabin so that we can have presentations utilizing the computer, flat screen TV, DVD player, and serve refreshments from the refrigerator and hot water machine. The trail camera crew, led by Donna and Ernie have diligently kept a half dozen cameras deployed and serviced. Danny Williams and Donna have kept the data up to date and archived. Except for the snow, they truly are our keepers of the wildlife, like the postmen of yore: "Neither snow nor rain nor heat nor gloom of night stays these couriers from the swift completion of their appointed rounds." Several of our members are active members of related organizations which use the Carlton for biking, hiking, birding and other activities. 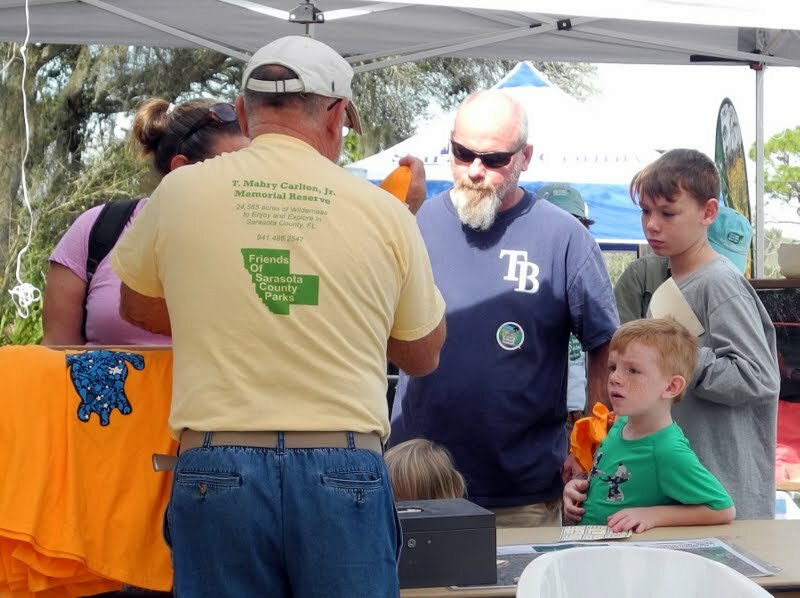 For example, Sierra Club outing leaders, Audubon members, and SCORR (Sarasota County Off Road Riders) conduct Carlton events through their respective groups. You may also find activities in the Carlton that are listed on the Sarasota County calendar. The Friends of the Carlton will sponsor a public open house on Saturday April 5, 2008, from 9-3.
of the Carlton at 941 486 2547. Johnson and gives excellent quality shots. The fawn picture is being used on the kiosk at Deer Prairie. present uses--water resource, protected wildlife habitat and passive recreation. east and north of the Windy Sawgrass cowboy camp. frighten any potential threat. If approached it will strike aggressively and the venom is potentially lethal. at hand. In the water the Cottonmouth swims with its head high out of water. 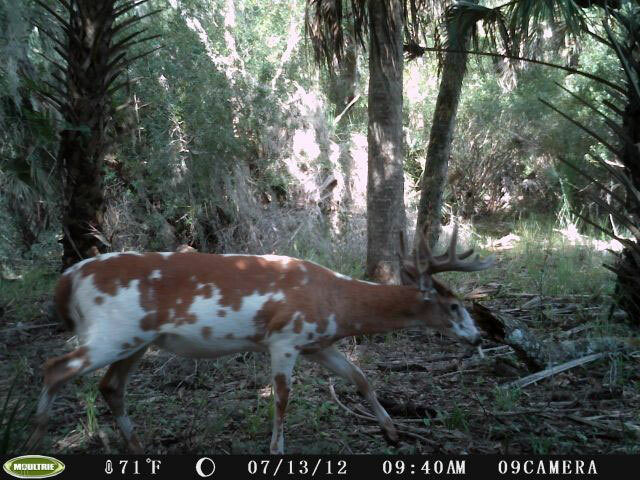 This picture was sent to me by the Orens from one of their trips to Myakka River State park. The April 5 Open House. See Rick. Manning the cabin—more help needed both on weekends and during the week. See Tom, Bill or Russ. Data entry—recording info from trail cams in database in Excel. See Sherm or Donna. Reset and paint self-guiding posts in public area (pink,yellow, blue, green, orange, and red trails). See Rick. Trail scouting and minor clearing for special walks (see Sherm). Newsletter composing/editing—in Word. See Rick, Sherm, Linda or Russ. Construction at the cowboy camp and the utility shed is on hold, pending funding from the County. Cow Tales and historical information excerpted from interviews with Boyce and others. Featured plants and birds and other seasonal flora and fauna in the Carlton. Snapshots. trail notes and sightings. Featured volunteers and special events. The Friends of the Carlton held a public open house on Saturday April 5, 2008, from 9-3. Many thanks to all the volunteers and organizations who helped us make this day possible and bring greater awareness of the treasures we have in these protected lands. Boyce Blackmon orients a visitor. Gigi Bates tries on a reptile necklace. Linda Lovallo demonstrates--one size fits all. Ranger Rick Storsberg and Land Manager Debbie Blanco discuss issues such as recreation, ecological burning and trail maintenance. Bob Fitzpatrick captivates us with the complexities of feral hog control. Nancy Edmondson returns from guiding a nature tour. Events not pictured were a walking tour with Tom Learmont, a butterfly walk by Jean Dubi, biking tours by Village Bikes, wildlife camera update by Donna Day & Sherm Stratton, GPS use for hiking by Peter Johansson and a presentation on the Myakka Wild and Scenic River by Stacia Hetrick. Closing remarks on the history of the Carlton were presented by Ranger Rick Storsberg and Boyce Blackmon who held the recreational lease on the property for 30 years prior to County acquisition. Thank you to all the other helpers: Russ Johnson, Bob Branson, Jim Courtwright, Bob Hladik, Charlie Sample, Carl Schwartz, and Pete Davis. Welcome back! You might not have noticed above a new e-mail address and a new trial website address for the Friends of the Carlton where you will find previous issues of this e-letter, meeting minutes, directions to and weather in the Carlton, upcoming events, forms for joining and volunteering, helpful links, slideshows of wildlife and more to come as we develop it and try out hosting options. We welcome suggestions regarding what you would like to see on that site. Possibilities: web galleries of seasonal flowers, seasonal birds, Parks and Recreation news from Rick Storsberg, land management news from Debbie Blanco, hiking maps, etc. Security Cameras, Fencing and Gate. In the summer when the park was closed due to flooding, thieves drove over the cable and cut away the cabin A/C compressor, apparently for the copper tubing. The new A/C is protected now by a chain link fence enclosure, security cameras, and a new gate into the service area. Kiosks. 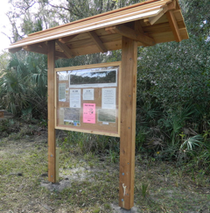 The Friends of the Carlton placed two new signs at the kiosks for the Myakka Island Trail behind the cabin and the Equestrian Trail in the Horse Trailer Parking Lot. The signs with wildlife photographs are near sign-out boards built as Eagle Scout projects. Most of the photographs were taken by FCR trail cameras, as were the pictures used on the Deer Prairie Creek kiosk. A sightings clipboard will be placed at the cabin entrance so hikers can share recent wildlife sightings or other trail notes. A new bike rack and rain gauge is in front of the cabin. Tribute Plaque Just west of the cabin, a large rock and oak tree have been placed in preparation for a commemorative site, recognizing the public service of former Florida Senator Lisa Carlton, daughter of T. Mabry Carlton, Jr., after whom the Reserve is named. Kayak Launch A new webbing material is will be placed on the riverbank for a 6-month trial period to protect the bank and make the site easier for launching. A working windmill and drinking trough have been installed at the cowboy camp near marker 43. Joe Sipos, SC staff member assigned to the Carlton, has had back surgery and will be recovering for several weeks. The Friends volunteers have been helping to fill in by sprucing up the public area, self-guiding trails and the horse trailer parking lot. Champion Tree Walk Auction The Friends of the Carlton helped raise funds for the restoration of a historic building at Philippi Creek Park by offering to sponsor a special guided walk to view “champion” trees in the Carlton. We provided a photo gallery of some of the trees. Tickets were sold at auction in October with proceeds turned over to the building restoration fund. Camping Discussions are underway possibly to allow remote, provisional camping at designated locations with pre-registration and fee. Cattle leasing proposal After getting feedback from the Friends last spring, Debbie Blanco presented the County Commission with a proposal to try cattle leasing on a limited basis on the Jordyn parcel which borders the Carlton at Deer Prairie Slough that has already been impacted by livestock. The proposal is under review by the County Commission. Timber Thinning There are timber thinning operations ongoing in the Carlton that may affect recreational activities. Area 1 is located in the central Carlton, south of the loop road and north of the power line where there was both a controlled burn and an uncontrolled fire caused by lightning. Area 2 is north of 20 on the Turpentine Trail and Area 3 is on the north end of the Stockade Trail. If you have questions, you can contact Debbie Blanco, SC Natural Resources, land manager in the Carlton, 861-5000. New Neighbors The Carlton is growing with the addition of contiguous lands that have recently been acquired under ESLPP (Environmentally Sensitive Lands Protection Program). The parcel at the west end of the FPL power line, formerly known as the Wild Turkey Club, is now County owned and renamed the Embry parcel. At the east end of the FPL power line, extending all along the Carlton east border, a 4640 acre parcel, called the Ranch Reserve, has been purchased. It includes a major section of Big Slough and extends south to Myakkahatchee Creek Park. A Conservation Easement has been purchased on a 7500 acre parcel east of that. The 500 acre Jordyn parcel adjoins the Carlton on the south border near Deer Prairie Creek. There are walk-throughs at both gates. Another similar parcel, the Churchill tract, abuts the Carlton on the south border near Tucker’s Camp. Access by footbridge from the Carlton is planned within the next 6 months. The gate at the end of Border Road has been removed but access is still closed. Along the river, only a few lots remain in private ownership on the east side. One is south of the “Youth Camp” and the others are south of the Turkey Club tract which is now County owned. The Ligon property on both sides of the river has been purchased and renamed. The western parcel is now part of the Sleeping Turtles Preserve that includes most of the land along the west side of the river from N. Jackson Road to Snook Haven. Parts of it allow equestrian access or pets on leashes. During the summer, Donna Day, Linda Lovallo and Sherm Stratton were invited by the Manatee-Sarasota Group of the Sierra Club to present a program on the Friends of the Carlton’s trail camera project for wildlife monitoring. As a result, several news media contacted the Friends and did stories about us. There was a feature article by Kate Spinner with photos in the Herald Tribune and a web gallery posted on their site. Bruce Asbury did a video piece for SNN that aired several times. And Jackie Barron did an interview that aired on WFLA. Despite all the good publicity, a second trail camera was stolen during the rainy season when we had pulled cameras closer to the paved road so that we could service them when the trails were flooded. We replaced one camera with donations and now have 3 devices deployed at remote locations, well away from public trails. Here is a male fawn (spots arranged in lines indicate male). Here he is a week later. His mother “stashed” him in the woods in front of the camera several times as she grazed in a nearby wetland. A leucistic (partial albino?) buck 1 year later (last month) at the same camera. Watch for atamasco lilies in recent burned areas—they often appear just a few days after a burn, especially under pines in wet areas, before anything else has sprouted. Just finished blooming, pine lily—along the central red trail, west of the intersection with the green. 1. Weed whack, clear branches, pick up trash at the kayak launch and parking area. 2. Pick up trash along Border Road from the bridge and along the MC Parkway to the gate to the water treatment plant. 3. Pick up trash along entrance and exit roads (exposed by burn). 4. Trim overhanging brush, throw debris from trails, reset and clear markers on orange, green and red trails. 5. Man the visitor’s center, sweep display cases and floor, update bulletin boards and re-supply kiosks. 6. Rake and remove pine needles, fronds from picnic area to decrease fire load. 7. Leaf blow pavilion, cabin sidewalk, parking lot and trails in public area. 8. Weed whack horse trailer parking lot. 9. Set cameras in field, locate with GPS, trim vegetation from immediate area, replace batteries and memory cards. 10. 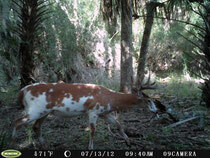 Download and re-title trail camera pictures, enter into Excel spreadsheet, save selected photos. 11. Compose electronic newsletter and distribute. 12. Transcribe taped (digital) interviews for Carlton history project. 13. Publicize Friends of the Carlton sponsored activities in local media and on website. 14. Gather trash for pick-up at the cowboy camp. 15. Trim overhead for mower access on remote trails. 16. Maintain trail markers on remote trails that can only be accessed in dry season. 1. Load trash into dumpster at cowboy camp. 2. Install fencing at cowboy camp near dipping pen. 3. Remove barbed wire fencing in selected areas of the Carlton. 4. Finish trail maintenance on blue, yellow, pink, and red trails. 5. Scrape and paint exterior cabin window frames. 6. Paint numbered marker plaques and replace throughout the Reserve; replace, reset, and clear markers. 7. Pick up trash on Jordyn and Churchill parcels. 8. 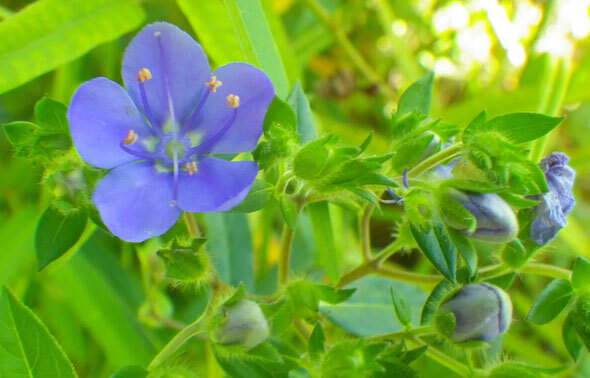 Help with GPSing exotic invasive plants as follow up to State grant (after training). There are volunteer opportunities on many other SC sensitive lands where several of the Friends also volunteer.